This past week was a greek and mediterranean foods week. We had our favorite [[Brick Chicken]], a new lamb dish based on this roasted, stuffed lamb concept, but using the leftover grape/port reduction from this recipe, which has been taking up valuable freezer space. Regardless, the lamb didn't turn out all that exciting. We have a few core Indian dishes we've learned how to make pretty well; but they're not quite enough to fill a week. Each time we settle on an Indian food week, we try a new dish, with ... well, mixed results. 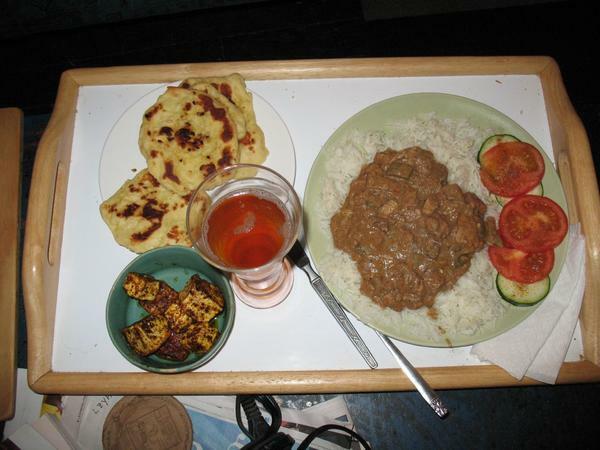 The new recipe this week was Mughal style lamb (stew) on saffron rice. We substituted fresh saffron pasta from Eastern Market for the rice. It was OK, but not really a "keeper" . We started the week with some oysters from BlackSalt, and then dived in to a full asian-inspired week. In which we bring out the big guns to defeat the last few months of winter vegetables. Due to some wretched flight delays, cancellations, and the like, we ended up with some extra time this week, and a hankering for spicy foods, so clearly it was time for a Caribbean week! This week we finally tried making Ethiopian food for ourselves - it's one of our favorite meals to eat out, so it was high time we explored the process. For a first try with nothing to go on but some recipes gathered from the Internet, we did... OK. All of these need tweaking and further work to really match our favorites from the amazing Ethiopian restaurants in DC.